The definitive reference to world writers from ancient times through the 20th century, this three-volume set presents the broad spectrum of world literature's great contributors. Hundreds of entries on major writers throughout the world cover the literary traditions of early Greece and Rome, Europe, Asia, Africa, the Middle East, and the Americas. Each volume contains critical biographies of poets, dramatists, fiction writers, diarists, and essayists. Certain anonymous workssuch as epics, odes, fables, sacred texts, and creation mythsare listed by title. Each entry includes a biographical sketch and a bibliography. Many also contain a synopsis and critical analysis of one or more of the author's major works. Coverage represents the high school world literature curriculum, from the anonymous epic Gilgamesh to Virgil and Homer, from Voltaire and Molière, and Margaret Atwood and Umberto Eco. 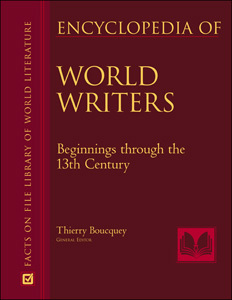 This volume covers world writers and great anonymous works from the beginnings of world literature through the Middle Ages. Entries include Beowulf, Gilgamesh, and the Song of Roland, as well as such famous writers as Dante, Marco Polo, Chrétien de Troyes, Confucius, and Murasaki Shikibu. This volume covers world writers from the year 1300 to the year 1800. Entries include Cervantes, Petrarch, Voltaire, Erasmus, Ibn Khaldun, and Cao Xuequin. This volume covers world writers from the last two centuries, including Chinua Achebe, Margaret Atwood, Mikhail Bulgakov, Umberto Eco, Gao Xingjian, Knut Hamsun, Mohammad Iqbal, Naghib Mahfouz, Marcel Proust, and Emile Zola. "This reference will stand out for its scope, particularly the accessible entries on the earliest literary activity." "...academic libraries as well as public and secondary collections that support world literature curricula will want to add this as a supplement..."
"...a useful set for high school, university, and public libraries supporting research in world literature...the breadth of coverage, clear writing style, approachable organization, modest price, and focus on world literature outside of Great Britain and the United States make this set particularly worthwhile. Recommended."